June 1 marked the beginning of the 2018 Atlantic hurricane season. Orange County residents are encouraged to take a number of storm preparedness steps prior to a hurricane to reduce possible damage to their homes. One of the most effective tools for reducing water intrusion in your home during a hurricane is the proper use of sandbags. Sandbags will not stop water from entering your home entirely, but they will drastically reduce the amount of water that may get through a door. They can be properly placed in doorways and in front of garage doors. They can also be used to cover drains in your home or hold down plastic sheets to make a better seal. In fact, sand makes a much tighter seal than bags filled with dirt. During the storm preparation phase, the County will make sandbag pickup locations available to the public for you to access. You can find these locations on the Orange County website or listen to local news updates for times and areas closest to you. These locations will close prior to the storm making landfall, so do not wait until the last minute because there may be long wait lines. Also, make sure you have proof of your Orange County residency, such as a driver’s license, because you will need to provide that in order to get the sandbags. Residents are typically allowed 10 sandbags per household. When you bring your sandbags home, try to determine the best place to use them according to your home’s elevations. Main entrances and sliding glass doors are a good choice. Start from one side and make a row with your sandbags, placing them as tightly together as possible. Then make a second row on top and remember to stagger the seams. As important as it is to know when and how to use sandbags to prepare for a hurricane, it is equally important to know when not to use them. First and foremost, they are not meant for people who live in evacuation zones. Sometimes, it is good enough to simply stack sandbags around your doors and garage to reduce the possibility of water intrusion. When the storm has passed, you can use the sand in the bags for certain applications of gardening, composting and landscaping. For more information on how to prepare for a hurricane, visit www.ocfl.net/storm. 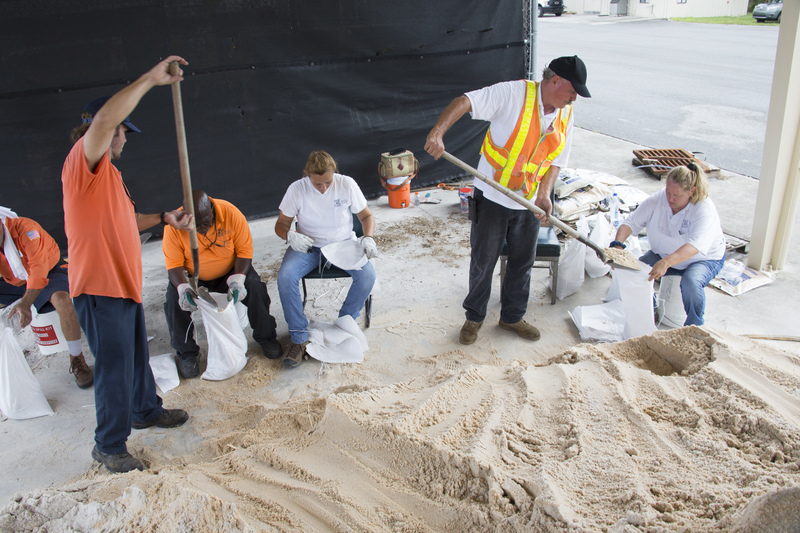 Photo Caption: Orange County Government Public Works Division employees provide sandbags to local residents during Hurricane Irma in 2017.